as of 4/12/2017, audio intro plus 2 film episodes. 1st Episode has English subtitles. Captain Pargimeos learns that even the best captains are not in command of their ship. Starfleet urgently needs to start serial production of Prometheus class ships. Citizens of the Federation are not that thrilled with the idea of fighting machines. This is when the negotiating team of Captain Pargimeos steps in. s01e04: Curtain Falls, https://www.youtube.com/watch?v=mGroTvZHnR4 (17:49). Captain Pargimeos and Commander Laverna are having a hard time. Is their entire mission going to be canceled? Are they about to be transferred to unenviable posts? All their differences aside, Masaryk's plays a conspiracy game reaching the highest positions in the Federation. In February 2017 they announced that they would not continue to produce this series. They did not feel that they could do so with the limitations of the Guidelines. https://www.facebook.com/startrekdiplomacy/?hc_ref=SEARCH&fref=nf Nevertheless, they did release an episode in April. 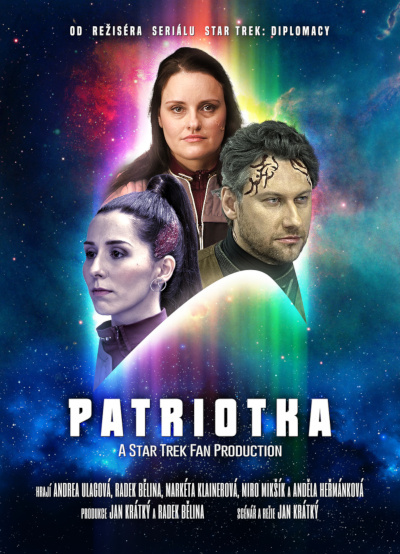 Patriot: A Star Trek Fan Production. Set in 2373, during a war in which the Klingons have invaded and are conquering Cardassian space. Cardassians flee, some to the Federation, but not all flee with good intentions. Released Nov. 20, 2018, https://www.youtube.com/watch?v=rb3LiblA2LY (0:12), a thank you to a German fan. Gambit of the Ancient Ones, https://www.youtube.com/watch?v=KSYYFgKfyX4 (9:40). Czech with English subtitles. High-quality Silver Age production, sets, greens screens, CGI, adult fans, good writing. The First Federation takes action during the Dominion War.